A House panel on Tuesday overwhelmingly advanced a measure to expand veterans access to private sector health care, while also agreeing to shutter some government-owned facilities. Just two Democrats on the House Veterans' Affairs Committee voted against the Veterans Affairs Maintaining Internal Systems and Strengthening Integrated Outside Networks (MISSION) Act (H.R. 5520), which consolidates the department’s array of community care programs into one. The bipartisan support for the bill was a significant accomplishment for the committee, which has worked for years to strike an acceptable balance between easing veterans access to private care while assuaging concerns that the process would lead toward the privatization of the department. “This compromise is one that we can all be extraordinarily proud to support,” Roe said. Rep. Tim Walz, D-Minn., the top Democrat on the committee, was one of two members who voted against moving the bill forward. He said he supported 95 percent of the measure, but had concerns about how its provisions would unfold in future years. The VA MISSION Act, for example, would fund the new private sector health care program through the regular discretionary budgeting process. While Walz supported that funding stream, he issued an amendment to shield it from potential cuts when budget caps are reinstated. Roe said the bill resulted after 18 months of negotiations and it was too late to make major changes. “Any amendments to the bill, no matter how worthy they may be, violate the terms of those negotiations and put us right back at square one,” the chairman said. He added that the changes Walz requested were merely to “appease the unions.” The American Federation of Government Employees, which represents 230,000 VA employees, has expressed significant apprehension about the measure, saying it would endanger the department by shifting resources toward the private sector. All three of Walz’s amendments were rejected. Acting VA Secretary Robert Wilkie applauded the committee's approval of the measure. It also has support from the White House, which is calling on Congress to pass the bill by Memorial Day. The Choice Program, which Congress established after the 2014 scandal involving department employees manipulating patient data to hide long wait times, is set to run out of funding later this month or in early June. The bill would avoid that pending crisis by providing $5.2 billion for the program before sunsetting it permanently in one year. The measure includes another controversial provision to put VA through a process similar to the Defense Department’s Base Realignment and Closure Commission. The measure would require the VA secretary to assess the department’s current capacity to provide health care in each of its networks and ultimately recommend facilities to close, modernize or realign. The secretary would then pass those suggestions along to a presidentially-appointed, Senate-confirmed commission. That panel would submit its recommendations to the president, who would then have to approve of the plan in full, in part or reject it altogether. Congress would then have 45 days to vote down the plan or it would automatically go into effect. 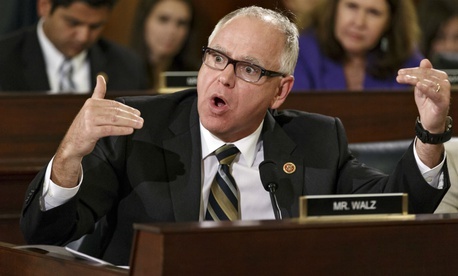 “I don’t know who’s in charge of the VA, really, with an acting secretary,” Walz said. AFGE has asked Congress to pause its movement on choice reform until VA has a permanent leader. The House committee also approved the 2018 VA Medicinal Cannabis Act (H.R. 5520) on Tuesday, a bill that would enable VA to research the impacts of marijuana on veterans suffering from post-traumatic stress disorder and chronic pain. The measure would promote such research by clarifying it is “well within the authority of VA” and requiring the department to report to Congress on how it plans to exercise that authority.